1. Went to Pathmark for batteries and ready-made coffee (yes, it wasn't until today that I realized no electricity means coffee maker no-worky). Struck out on batteries, but scored on Starbucks ready-made lattes. So what we'll lack in light we'll make up for in caffeine. 2. Ask my husband to set the table for lunch, and realize when doing so he has thrown-out my iced coffee because "the ice looked melty." In the midst of my outrage, my mother suggests perhaps I could just write an Instructions for my Husband post about it and let the rest of us eat lunch. Realize this housing-an-evacuee thing may be more difficult than I had originally thought. 3. Obsessively watched CNN and Weather.com, even though they had no new information. 5. Wrack my brain deciding where my kids should sleep most safely over night as storm, rain, winds and tornadoes approach our New Jersey home. 6. Wondered how I would pass the day tomorrow without electricity. Was glad to see Cool Mom Picks had Dozens of ways to turn hurricane time into fun time, until I realized they were almost identical similar to my 6 Ideas to Keep the Kids Entertained Indoors - Even if the Power Goes Out I wrote for New Jersey Family two days ago. 7. Considered the implications for my mom - who refers to herself now in the third person as "The Evacuee"- that all major news outlets are exclusively showing her apartment building when talking about areas of Manhattan that will be hit the worse by the storm. 8. Pass part of the evening looking-up children's books about hurricanes and heroines named Irene. 9. 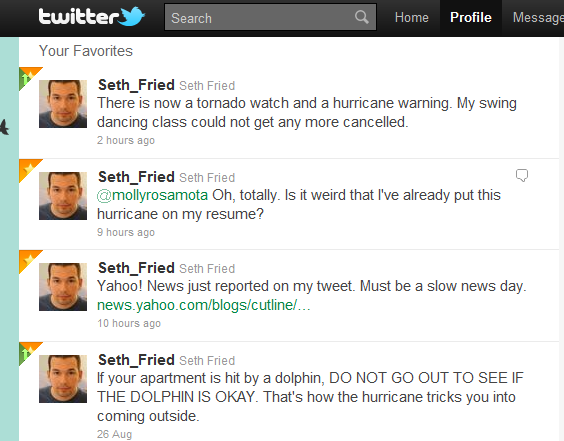 Pass the rest of the night on Twitter, find the hilarious tweets of Seth Fried, which are so funny it almost makes the hurricane worth it. 10. Go to sleep, hopeful I will wake-up in the morning and this will all just be a bad dream. Hoping for everyone's safety in the storm. I'm up North right now but I guess the storm hit my town pretty hard. We're inland so we don't have the water surges though. I am driving back home tomorrow so I'm curious to what I'll find. I'm glad you're safe!!! Hope everything is ok, and drive safely! I can't get over the fact that someone stole your stuff & thst your mom's apartment has been on the news! Heehee. Great post. Hope you are surviving ok out there! At least you still have your sense of humor. Let us know if you want to ship a niece over here. There is no "e" in judgment. -E.
oops, maybe there was just a tiny bit of "E" in judgement. also, why is spellcheck letting that get by it? 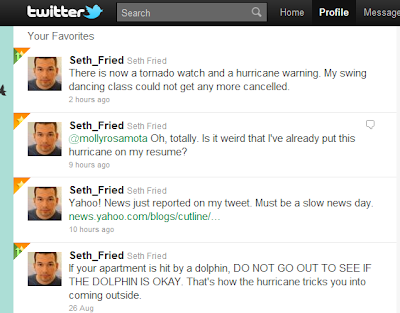 That Twitter feed is HILARIOUS. The media is nothing without you Anna.